It was interesting to hear the UK Prime-Minister, yesterday, indicating he wanted to support pensioners (who represent the most significant voting group in the UK) and, unsurprisingly, that a similar spin came from the Opposition. So, the politicians are focussed on next year’s election and there will no doubt be a series of short-term initiatives over the coming months. This initiative was closely followed by an economic “doom and gloom” speech from The Chancellor, who indicated lots of budget cuts following the next election (I am not sure that tactic will win votes though) and, in the meantime, most of the country is floundering though some of the wettest weather any winter has brought us! As one of the voters who the politicians are “chasing” I find the current views on what amount to important political issues very strange. 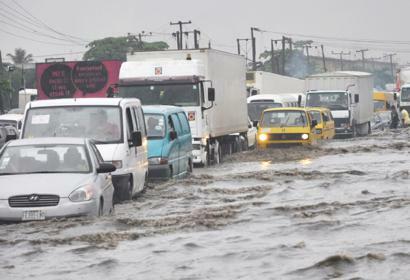 There is no doubt in my mind that the weather systems of the world are starting to change (as predicted by those who have described the effects of global warming) and that the adverse weather we have seen recently will get worse, but the politicians do nothing to address this issue. This is a classic symptom of short-term thinking that governments are driven to by the nature of the five-year term (something that led previous governments to ignore the problem of pensions for the baby boom generation). It is clear that storm damage is already affecting the economy and that if things go on as they have been for the last few weeks that the total cost will escalate. This is a classic case of a need for a long-term scheme to improve infrastructure. It is no good the Prime Minister pushing blame, and who should provide solutions, toward local government, the problem of the impact of global warming needs to be addressed in many ways and one of these is to improve water management – this means solve issues of flooding as well as improving long term storage issues. This would represent an ideal opportunity for industry (the Water Companies) and Government to work together over a twenty year period. 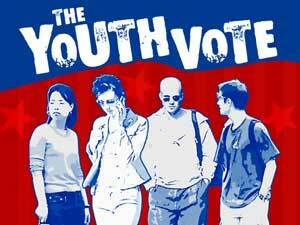 This would also be an unusual political gamble that would require the usual opposite views to be put aside and the main political parties to agree to discuss details in a constructive manner – something that I think might encourage young voters to vote! So, stop trying to woo voters with short-term offers that have little or no real value and start to look like a truly altruistic Government. Bring the Opposition on board with the aim of creating a mechanism for long-term schemes to be financed properly and I for one might change the way I vote! Invest in the infrastructure of the country and strengthen the economy through jobs and reduce the impact of disasters. 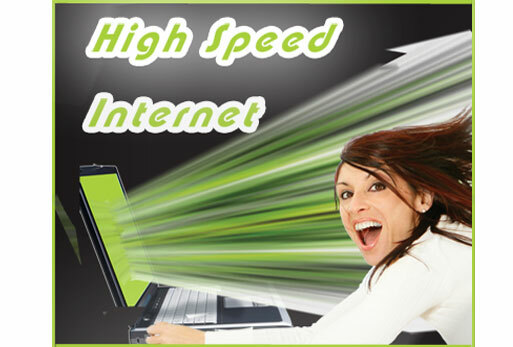 Broadband speeds – slow progress? Having just moved house (May 2012) I find i have gone from a Virginmedia connection (formerly NTL fibre optics) to a BT landline (through Sky) and what a difference I notice in download and especially upload speeds! This subject seems to have disappeared out of the news, but there is still a major issue to be addressed by the government, if they are to make good use of modern internet capabilities within the economy. The reason for this blog is that I am disappointed with the speed I get from out BT landline, but also because I think this is a typical example of a missed opportunity – a new housing estate with poor internet speeds. I cannot understand why there is no fibre optic capability on this new estate, nor any sign that there may ever be such a fast connection. It seems to me this is one place the government could provide regulation (just as they have regulated the energy use of new buildings) by insisting that a new housing estate should be provided with fibre optics and a choice of supplier who can use this facility! As you can see from the data at the top of this blog, I am only getting 5Mb/s download speed (against a maximum offered speed of 8 Mb/s; although the advertisements suggest upto 14 Mb/s) and an upload speed of only 0.68 Mb/s! This illustrates the other area that needs government regulation – advertised speeds are theoretical maximums, not actual situations. This is very misleading and should not be allowed – it is the use of the phrase “upto” with the offered speeds that is particularly misleading. Although, I could choose another supplier (other than Sky) this is unlikely to help me as they all have to use the BT landline. I have asked Virginmedia if they plan to lay fibre optics in the area, but they may not be able to gain access to do so! BT would make no comment about upgrading our area to fibre optics. So, I imagine that nothing will change in this area, the government simply make noises when they have to, but implement no policy changes. The suppliers are only competing on price (except for Virginmedia) and there is no coherent policy to introduce fibre optics in areas that could be upgraded without too much disruption – very disappointing! 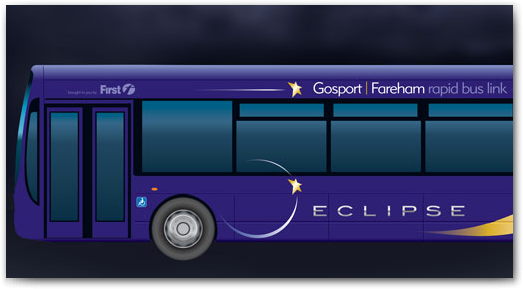 This is my own very personal view on the new bus-lane/bus system – Eclipse – for Gosport. 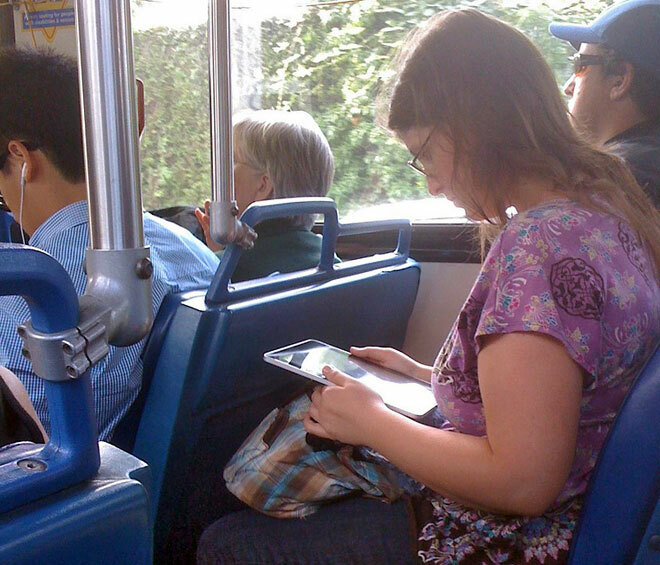 However, before I describe the new transport system, here is a little background…. 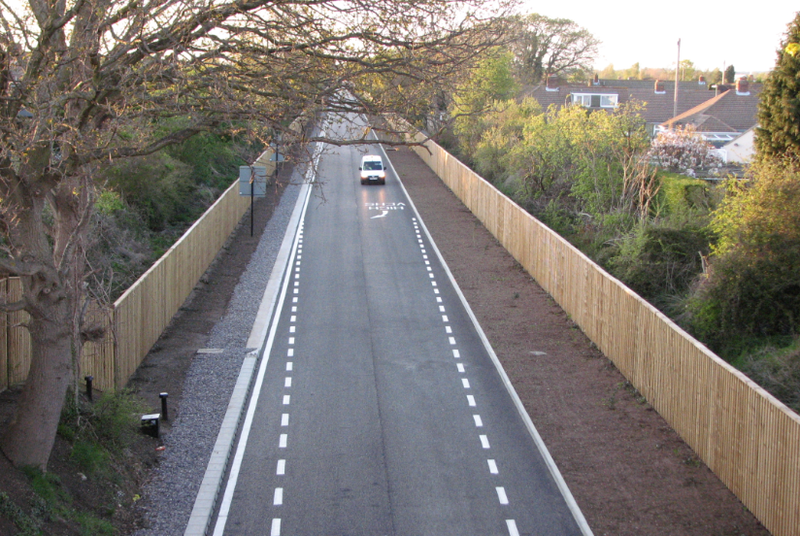 Gosport is accessible by only one road – the A32 – and as a consequence has had a major problem with traffic build up over the last several years. This has been exacerbated by new building project near Lee on Solent as well as at Priddy Hard and St. George’s Barracks, which have increased the number of cars using the A32. What is really needed is a better infrastructure to enable all traffic to move in and out of Gosport and this will become particularly required if HMS Sultan is used for new housing builds! I have always worried that Gosport might “die” if this infrastructure is not improved, as businesses will decide that access to Gosport is too slow and too expensive to justify investment. What the local council proposed was a dedicated tram-based system, which was originally to run through a tunnel under the harbour to Portsmouth. However, the cost was too high and this was revised to a busway, used only by new buses that would run faster to Fareham from Gosport, via Fareham Railway Station. I understand this has cost between £20-25 million to build and it finally opened this week. During the building one of the main access roads to the Bridgemary/Peel Common area was closed for the best part of a year causing chaos and costing a lot in extra taxi fares! The first problem is that, unless you live close to the busway actually catching the new buses requires quite a trek (from my house a good 15 min walk). The second problem is that only the new buses can use this busway, so they will not improve the transport infrastructure and heavy goods vehicles will still queue. Finally, the new buses have also been allocated a bus lane on the road out of Fareham, past the railway station, which means that the normal two queues of traffic are now compressed into one line, increasing congestion further. But, from a personal viewpoint, I am very disappointed to see that the introduction of this new service has coincided with a 50% reduction of the buses running through Bridgemary. It appears to me that this new exercise has afforded First Group with an opportunity to cut costs, not to improve the service. I seem to remember we were also promised bigger, articulated buses that would hold many more passengers – that seems to have disappeared during the final stages of providing the service. The loss of the 86 service means we no longer have easy access to the Elson area. Finally, I laughed when I discovered that one of the main advertising points of this new service is the availability of WiFi Internet access – by the time you boot your computer and get logged on to the system you’ll be in Fareham! If not, it is not much of a rapid transport system! OK, I accept that statement is too sarcastic and that the internet connection is usable, but it is not likely to help reduce transport problems in Gosport. I cannot see that internet connection, new and comfortable buses with wooden floors, or a speedy service will take people out of their cars and put them onto buses – that requires an integrated transport policy where people have to park up and use public transport to reach specific destinations. So I doubt this new service will change the crowding on the roads around Fareham and Gosport, as I have said, if anything, it may make things worse! I cannot hold back any longer from inputting to this debate about pensions and, as someone who has retired at what appears to be “the best time”, I hope I can be rational and subjective. I am also someone who is a part of the baby-boom generation of post-war growth in the population, so I have a view that includes this knowledge! The baby-boom was encouraged by the post-war governments to help generate growth after the difficult post-war years of the late 1940s and has been “known about” by every government since then (both Conservative and Labour). There have been some major policy changes over the years that have been introduced to compensate for the effects of the baby-boomers coming through the system (one that springs to mind in my own area was the introduction of “New Lectureships” to boost University teaching capability during the 1970s). There were initiatives when I was school, such at the Nuffield teaching scheme, which may also have been a reaction to the baby-boomers! What has this to do with pensions, I hear you ask? Well, the current government is claiming that part of the problem we now face, with what they say is an unafordable pension scheme for the public sector, is the increasing numbers of pensioners – us baby-boomers! BUT, I have to ask, why has no government faced up to this in the last 60 years? If any government, during that period, had increased NI contributions by 0.1% then there would never be a predicted short fall. But such a policy was never even discussed in public; although, it must have crossed the mind of some Chancellors along the way – surely? However, the situation is more complex than our current coalition mess (sorry, government) would have you believe. 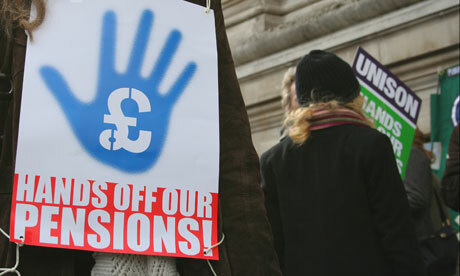 For a start all the public sector pension schemes are in the black (even the University Superannuation Scheme, which changed its rules recently to ensure this) and not, as the government would have you believe, running into a debt crisis. Therefore, to talk of such short falls is totally wrong. The predicted short falls are more about the impact of a weak Stock Market than they are the reality of the situation. The government seems bent on using inflammatory statements such as describing the strikes as “futile” and statements suggesting negotiations where happening when, before the strike, there had been no such negotiations since November 2nd. A more sensible position would be to encourage more public sector workers to contribute to a pension scheme, especially the young who would benefit most, which would increase input and keep the system solvent for many years. Then, I notice the media has bent their coverage so that this appears as a dispute between the teachers unions and the government; whereas, in reality teachers represent a minority of public sector workers who are much better paid than the vast majority. The major employer is the NHS and many of these workers are the lowest paid of all public sector employees. Their main desire is to secure their future with a reasonable pension (although this pension will always be limited by their already low salaries). The fact that the government wants to delay and reduce their pension is immoral and not striking as the government and the press suggest! My view is simple – this is a problem created by weak governments, over a protracted period, and any current government must carry the debt of what previous governments have failed to do. This has been a pet whinge of mine for some time, so I think it is about time I made some comments. This idea was spurred on by the realisation that the current government were carrying out a review of the subject. General waste – this is material clearly marked non-recyclable and badly soiled paper or kitchen rolls. Recyclable waste – material clearly marked with the recycle symbol and materials that are on the council list. Food waste – any material, other than meats, which can be composted. Glass bottles and containers – wine bottles, food bottles and any other glass containers. Our general waste around the house is collected in various waste baskets in varying locations, including the bedrooms and lounge, but in the kitchen, where moste waste is produced, we use carrier bags that come with our online shop (more about this later, as well), which is a s near to recycling these bags we can get (other than to send them back to Sainsbury, which I have considered). At the moment this works quite well as it provides an easy way to dispose of our rubbish (easy to handle and bin. The council collect this waste every other week, which is OK during winter, but has led to bluebottles and maggots during hot summers (not this year)! 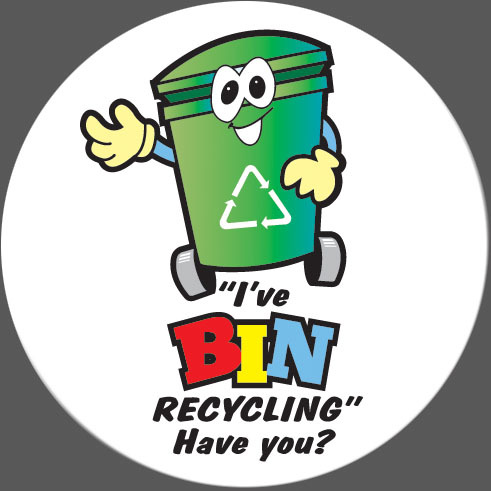 Every other week the council collect recyclable waste and we have a bin in the kitchen dedicated to this waste, we also collect magazines and flyers in a basket near the front door, which go into the recycle bin. We also use carrier bags, in the kitchen, to collect compostable food and this goes into our compost bin at the bottom of the garden. I then use this compost on the roses during winter. I am afraid we do not recycle glass because the nearest facility is a considerable walk away and I am not prepared to make that journey on a frequent basis. Shredded paper (such as bank information) is not recycled, which seems odd since this is paper – we have to remember to put out this paper waste with the general waste! Certain plastics are not recyclable, many are used as food wrapping, but this policy is not clear and is illustrated by the provided list – “Tetra Paks” (what are these? ), “polystyrene” (OK, I know what this looks like, and not just the expanded type, but do others? ), yoghurt pots and food containers ( a bit vague I think). Aluminium foil and scrap metal (how do you define scrap metal for goodness sake) have to be taken to the recycling centre – not to easy if you don’t have a car, which I think promotes a low-carbon footprint! But, my main problem lies with identifying recyclable waste and the possible future ideas of charging people who do not recycle. 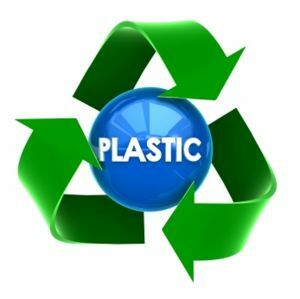 If I could advise the government on this my main comment would be to target the manufacturers of packaging materials as a first step – they should be “encouraged” to use recyclable materials and they should be enforced to clearly label EVERY item of packaging as recyclable or not – no ambiguity! Then, every council must be obliged to recycle ALL items marked as recyclable – no oddities, or confusion about types of plastic – and they should all have the same policy and procedures. I don’t want to go to far down a discussion of lowering carbon footprints, but as someone with a well-below average carbon footprint I feel obliged to explain that current policies on taking material to a local tipping area is a very high carbon consuming exercise! Councils should provide a collection service, AT A REASONABLE COST, for electrical items, batteries, wood, glass and soil. Many of the proposed plans discussed by various governments have put the emphasis on retraining the public, but this is not where the problem really lies and much more could be done to change the policies of the packaging industry and supermarkets – whatever happened to brown-paper carrier bags, or am I the only person who remembers them? One example of packaging problems is labels, attached to pineapples, that are not biodegradable – these frequently end up in the compost, but are still intact when we remove the compost at the bottom of the bin! The idea that the government will not force supermarkets to provide recyclable packaging amazes me, but I am sure the supermarkets will say there is an associated cost – I think not, but what do I know!